Yestersol's drill pre-load test was successful, so today we are go for a drill attempt at "Kilmarie!" The front hazcam image from yesterday's test (shown above) is a helpful visual for understanding how close our new drill location will be to the last drill at "Aberlady." In this image, you can see Curiosity resting the point of the drill on the future Kilmarie drill target along with the old Aberlady drill hole, a little to the left of the arm. It's been a while since we've drilled two locations so close together! Avid readers of this blog will recall we decided to drill again in this area because we saw some irregularities during drilling Aberlady. Specifically, we weren't sure we'd collected enough drill material for both CheMin and SAM analyses at the Aberlady location, so we're hoping we can be more confident in the amount of sample we collect at Kilmarie. I was staffed in the role of Surface Properties Scientist (SPS) during planning yesterday and today. One of my responsibilities as SPS is to help assess whether the terrain Curiosity is parked on is stable. Curiosity's arm is so big and heavy that moving it causes the rover's center of gravity to shift. If Curiosity isn't firmly parked, moving the arm could inadvertently move the entire ~1 ton rover, which could result in hardware damage. Yesterday, we determined Curiosity had parked on a flat surface and five of the wheels were firmly in contact with the ground. However, the right front wheel appeared to be sitting on a very small rock (~2-3 cm) that was located right in the middle of the wheel. We had a lot of conversations about what the risk of the vehicle slipping was and whether we thought the rock we were sitting on might shift. Using our experience testing similar situations in the Mars Yard at JPL and knowledge of properties of the terrain around the rover, we decided the risk we'd slip was very small, and gave the "OK" to go ahead with arm activities. Images taken before and after the drill pre-load yesterday confirmed we hadn't moved at all and were correct in our assessment. On December 19th, the MSL tactical team planned 10 sols (!) on Mars, so that everyone could take a nice break over the holidays. The Sol 842 commandsequences were successfully received by Curiosity, and all the dataneeded for planning were returned to Earth, including MAHLI images of the rightfront wheel. Unfortunately, the Sol 841 command sequences could not be sent to MSL because of a transmitter problem at the Deep Space Network (DSN) antenna. I was happy to see that the Sol 840 MAHLI images we planned on Monday came out nicely. After a successful investigation of the Chinle outcrop, Curiosity is ready to move on to the Whale Rock outcrop. The main excitement today was that, as the team was busyplanning for sols 833 and 834, NASA held a press conference to share some ofthe results of our recent investigations in the Murray formation, in thefoothills of Mt. The activities planned for the Thanksgiving holiday went well, and the data received so far look good, including MAHLI images showing the brushed target "Puente." Curiosity is currently investigating the Alexander Hills outcrop. The difficult 35-meter drive planned for Sol 817 went perfectly, placing the rover in position for arm activities on the Alexander Hillsoutcrop. Over the weekend 3-sol plan, Curiosity will wrap up the investigation at Book Cliffs and drive toward Alexander Hills and Carnivore Canyon. Over the past few sols Curiosity has been investigating the Book Cliffs outcrop at the Pahrump Hills. Curiosity is still investigating the Book Cliffs outcrop on our second pass at the Pahrump Hills. After a successful drive on Sol 812, Curiosity is well positioned for contact science at the Book Cliffs outcrop. Curiosity continues to investigate the Pahrump Hills. With the weekend coming up, we are working on a three solplan for sols 809-811. Sol 806-808 Update on Curiosity from USGS Scientist Ryan Anderson: Congratulations Rosetta! MSL planning is no longer restricted, but today'scommands must be sent to the spacecraft earlier than usual, so tacticalplanning started 1 hour earlier than usual. I'm not on shift today, but keeping up with planning because I'm scheduled as SOWG Chair again on Monday . The short drive and wheel scuffing activities planned for Sol 799all completed as planned, leaving the rover in position for detailedexamination of the scuff . The initial reconnaissance of the PahrumpHills outcrop is complete, and the 53-meter Sol 797 drive successfullyplaced the rover near the ripples of interest. The 30-meter drive planned for Sol 794 completed perfectly, placing therover near laminated blocks shed from the Whale Rock outcrop (visible at upperright in this image ). It was another fun day of operations as we planned Curiosity’s continued investigation of the Pahrump Hills. It was a busy day of rover operations here at the USGS. Sols 785-786 Update On Curiosity From USGS Scientist Lauren Edgar: Comet Siding Spring Over the weekend, a number of Mars spacecraft observed a rare encounter with comet Siding Spring . The experience I gained planning the MARDI drive"video" for Sol 780 helped me prepare for another MARDI video during the Sol 782 drive. The 22-meter Sol 780 drive completed as planned, placing the rover near "Book Cliffs" (visible at the right side of this image ). We were originally planning to perform some arm tests on Sol 780 to help diagnose the fault that occurred last weekend, but it was decided thatthey were too risky. The Sol 778 data show that the arm instruments are safe, and the arm is ready for moreactivities. Over the weekend, Curiosity was supposed to perform a number of MAHLI activities to image the drill hole and the target Morrison, along with APXS on Morrison, but unfortunately an arm fault occurred during the observation of the drill hole. The Sol 775 MAHLI activities were planned in advance, so it was an easyday for me as uplink lead--I only had to make minor changes to theplan. I'm scheduled to support MAHLI/MARDI uplink tomorrow , so today I'm getting familiar with recent results and near-term plansafter spending a couple days focusing on other projects. During the nighttime MAHLI imaging on Sol 768, there was a problem with arm positioning that prevented the subsequent arm activities from completing. The tactical team took a day off Thursday to make the transition from restricted (every other day) to nominal(daily) planning. Curiosity continues to investigate the Pahrump Hills outcrop. Curiosity is currently investigating the Pahrump Hills outcrop. After our successful drill last week, the main event intoday’s sol 765 plan is dropping off the drilled sample in CheMin, which willtell us what minerals are in the rocks of Pahrump Hills. Arm activities will resume on Sol 762, starting where they left off onSol 759, with transfer of the drill sample to the scoop and Mastcam imaging of it. The Sol 759 drill hole looks good, but there was a problem with one of the rover's gyroscopes that halted thetransfer of drill sample to the scoop. Sol 759-760 Update on Curiosity from USGS Scientist Ryan Anderson: Drill Baby, Drill! It’s time to drill! The mini-drill over the weekend showedthat the Pahrump Hills outcrop is nice and stable, so the main activity in thesol 759 plan is a full drill and the associated images from Mastcam and MAHLI. Curiosity has had a busy weekend! We arrived at the locationcalled Pahrump Hills, which has a nice flat expanse of bedrock for us to drilland get our first taste of Mt. After a successful 114 m drive through Amargosa Valley on Sol 751, we are planning our arrival at the Pahrump Hills! The scenery is fantastic, and this Navcam image shows the bright outcrop that we intend to investigate. As expected, the Sol 748 drive put the rover in a good location to view the path toward Pahrump Hills . The Sol 747 post-drive data were not received until 11:30 PDT today, so we are planning another "rapid-traverse" sol. The Sol 746 drive put the rover in a good locationfor imaging the terrain ahead, which looks good for a long drive on Sol747. The Sol 744 drive went as planned (32 meters), and anotherdrive is planned for Sol 746. We have not received any data from sol 744 yet, so sol 745is a simple day of untargeted remote sensing. The weekend plan is very ambitious, with a bunch of targeted remote science observations on Sol 741, contact science on Sol 742, and a long drive on Sol 743. Curiosity is about to ingress into Amargosa Valley. Curiosity has almost reached an ingress point into ArmargosaValley. Curiosity is driving across a plateau towards an ingress point into "Armargosa Valley." The volume of data sent from MSL to Earth has been less than usual overthe past few days because the Mars Reconnaissance Orbiter (MRO) wentinto "safe mode," a software state that ensures ample solar power andtelecommunications. Yesterday we did not receive as much data asexpected, so could not drive as originally planned. Curiosity is back to driving! We are taking the high road around Hidden Valley to avoid potentially deep ripple fields, and making our way towards a large crater. After much study and discussion, the MSL team decided not to attempt to drill again into the rocks in front of the rover . While we wait for data acquired on Sol 726 to be received later tonight, the Sol 727 plan includes only remote sensing observations. We were hoping that the Sol 726 plan would include full drilling of the Bonanza King target, but the downlink from Sol 724 showed that the mini-drill activity did not complete successfully, probably because the rock moved during drilling. We are still looking forward to data from sol 724’s mini-drill experiment, and since we don’t havethat yet, we can’t do the full drill in the sol 725 plan. Everything went well over the weekend, and the drill target seems to be nice and stable, so for the Sol724 plan, Curiosity will do a "mini-drill" into Bonanza King . We’re gearing up for our fourth drill hole on Mars! For the sol 721 plan, we have a long block of timededicated thoroughly analyzing the drill target Bonanza King . Today is a restricted sol, so we are planning a number of untargeted observations. Curiosity is at the northern end of Hidden Valley, and we are preparing for condensed drilling on the target Bonanza King . Planning is "restricted" this week again (Sol 717 post-drive data will not be received until late this afternoon), so only untargeted observations are planned for Sol 718. The plan for Sol 713 is to do some brief ChemCam and Mastcam observations of a target calledThorndike, and then drive. Sol 713 Update on Curiosity from USGS Scientist Ryan Anderson: High Road or Low Road? Curiosity is still at the northern end of Hidden Valley, and the rover planners are trying to decide on the best approach for upcoming drives. Curiosity is still at the northern end of Hidden Valley. Curiosity has just entered Hidden Valley! For a view into the valley and information about our plans for exploring the geology, check out the recent press release. Today we planned contact science (APXS and MAHLI) on a rock target named Thimble, and an extra MAHLI image of an adjacent rock named Poleta. Today we are planning Sol 705, and Curiosity is just about to drive down from the Zabriskie Plateau into Hidden Valley, where the terrain should be much easier to traverse. I should have mentioned yesterday that the Opportunity rover recently broke the off-planet driving record that was previously held by the 1973 Lunokhod 2 lunar rover. After the 13-meter drive on Sol 702, MSL is in a better position to see the terrain ahead . No science uplink was sent to the rover for sol 697 or 698 because the engineers are investigating an issue with the rover's backup computer. We’re slowly picking our way across the rugged cap-rock of Zabriskie Plateau. There isn't time today to plan 3 sols of activities before commands for Sol 693 must be sent to the rover, so no activities are being planned for Sol 693. Sol 691 Update On Curiosity From USGS Scientist Ken Herkenhoff: Plasma! Some of the MAHLI images taken during the Sol 687 ChemCam LIBS measurements of Nova captured the plasma generated by the laser ! The Sol 690 drive completed as planned, totaling nearly 30 meters over relatively rough terrain. Many of the scientists on the MSL team are attending the 8th International Mars Science Conference this week on the Caltech campus in Pasadena. The sol 683 drive was cut a bit short because the rover yaw exceeded the specified limits for the drive,which is a fancy way of saying that the rover steered away from its planned route to avoid an obstacle. On Sol 683 Curiosity drove across a ripple to see how the vehicle performs in the loose sand. The imaging of the rover wheels went well last weekend, and we are ready to drive again on Sol 683. The Sol 677 drive was stopped after almost 20 meters (out of 57 m planned) by the autonomous navigation software, when it detected an obstacle more than 20 cm high. The Sol 676 drive halted after about 16 meters of progress (out of ~39 m planned) because the rover's yaw diverged too much from the commanded heading. 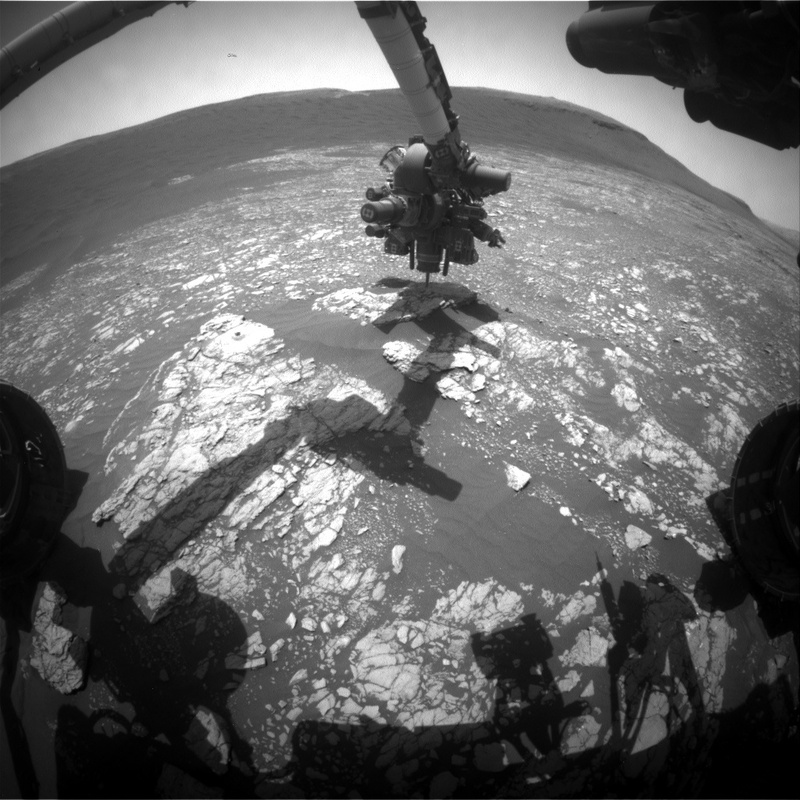 Last weekend, MSL successfully backed out of the sandy ripple, pausing to image her tracks . I'm MAHLI/MARDI uplink lead today, planning Sols 673-675 to get MSL through the weekend. Today we honored the contributions of women on the MSL team, with 75% of the operations roles filled by women ! I was on duty as the Geology and Mineralogy Science Theme Lead, and it was an exciting day of planning. After a 107 m drive on sol 670, we are now in Shoshone quad, and just 160 m from the edge of the landing ellipse! The sol 671 plan is a lot like the sol 670 plan, with a 3 hour drive as the main activity. Happy new year everyone! As of around 3pm (Mars time) on sol 669, Curiosity will have been exploring Mars for a full martian year (687 Earth days). Sol 669 Update on Curiosity from USGS Scientist Ryan Anderson: One Mars Year! On Sol 665 Curiosity is planning to drive through Robert Frost Pass into Moosilauke Basin. I’m hoping to be able to resume blogging about MSL soon, but it will be difficult to reportvery frequently because of continuing personal and professional commitments. Apologies for not blogging more frequently--my personal life has become more exciting and I'm going to have to take a break from this blog, at least for the next few months. I was SOWG Chair early last week, when we planned the mini drill hole . The data returned from Sol 610 showed that the rover is stable, so the weekend plan includes lots of arm activities. The rover bump went well, and the selected drill target is within reach. The Sol 610 plan contains fairly simple, untargeted observations, including Mastcam and Navcam mosaics and a series of Navcam images of the western sky right after the sun sets behind Mt. Sol 608 Planning: The drive and other activities planned for last weekend went well, and lots of nice images of the outcrop in front of the rover were received early Monday morning. I was scheduled as MAHLI/MARDI uplink lead last Friday, so I stayed an extra day in Pasadena after the MSL team meeting and worked at JPL. Thursday was the last day of the MSL science team meeting, and the discussion shifted from science results to analysis of wheel wear, both on Mars and on Earth. I'm attending a 3-day meeting of the full MSL science team, so I'm less focused on rover operations than usual this week. On April 14th, Mars made its closest approach to Earth this year. It was a busy day for the tactical uplink team, planning 3 sols to get MSL through the weekend. Unfortunately, the set of commands sent to the rover for Sol 596 were not received, so the rover correctly responded by executing the runout sequence that is appended to every day's command bundle. The surface near the rover isn't very interesting, so planning for Sol 596 focused on driving toward the outcrops up to 50 meters away. Mars is at opposition today, so Mars will rise at sunset and be visible all night here on Earth. The rover will stay put on Sol 594 and acquire lots of ChemCam and Mastcam data on interesting nearby rocks . MSL has arrived at The Kimberley waypoint! The Sol 590 plan was dominated by Mastcam stereo observations of the extensive outcrop in front of the rover. Another successful drive on Sol 588, so another drive is planned for Sol 589 after Mastcam and ChemCam observations of a soil target named Chirup . The rover drove about 22 meters on Sol 587, to a location with a better view of the path ahead . All of the activities planned for the weekend went well, and lots of good data have been received, with more on the way. MSL planning will transition from restricted to nominal next week, so the weekend plan includes only 2 sols, 585 and 586. MSL planning is still restricted, but because the rover has not moved we were able to plan more targeted contact science on Sol 584. The bump toward the outcrop put us in a good position for contact science, so it was a busy day for me as MAHLI/MARDI uplink lead. Planning is still restricted, so the Sol 582 plan includes only untargeted observations. There was a minor problem with the Sol 576 imaging of CHIMRA that prevented the rest of that sol's plan from completing, and concerns about the safety of the remote sensing mast prevented uplink of the Sol 577 commands. The Sol 578 activities were interrupted by another arm "fault" caused by a command error, but this error is well understood, and the rover is healthy and ready to resume arm activities on Sol 581. Planning is still restricted, so the Sol 577 plan includes only untargeted science observations. The Sol 574 post-drive images show nice outcrops in front of the rover, suitable for contact science. Sol 576 Update On Curiosity From USGS Scientist Ken Herkenhoff: "thwack"
MSL and Pasadena times are out of synch, so planning is restricted and Sol 575 is an untargeted science sol while we wait for the data needed to drive again. The rover moved about 74 meters on Sol 568, and a ~100 m drive along the path toward "The Kimberley" (shown on image) is planned for Sol 569. Sol 569 Update On Curiosity From USGS Scientist Ken Herkenhoff: Toward "The Kimberley"
MRO is still in safe mode, but enough data were received via Mars Odyssey to allow another drive to be planned on Sol 568, about 70 meters. After I finished my SOWG Chair shifts last week, I took some time off to celebrate my son's birthday. The Sol 561 drive went well, and the rover is in a good location for MAHLI wheel imaging, so the Sol 562 plan includes 4 sets of wheel images. At the beginning of tactical operations this morning, the plan for Sol 561 was to take a set of MAHLI wheel images. It's been a while since I traveled to JPL to serve as SOWG Chair for MSL planning, so I decided to spend a few days in Pasadena this week. I have been traveling this week to a meeting of the HiRISE (the big camera that has been taking images of rovers from orbit, science team, so am catching up with what MSL has been up to. The Sol 549 drive brought the rover close enough to the outcrop dubbed Bungle Bungle to allow MAHLI and APXS measurements, so the Sol 550 plan focuses on contact science. The rover drove over 100 meters on Sol 548, so it is time for another full set of wheel images to monitor wear. Testing on Earth has shown that driving backward should reduce wear on the front and middle wheels, so the Sol 547 drive was the first long, 100 meters, backward drive . Monday was a holiday (Presidents' Day) for some of us, but not for the MSL tactical team. I'm SOWG Chair again for another 2-sol plan, and it's been a more hectic planning day. The Sol 533 toe dip went well, leaving the rover's front wheels on the crest of the dune . The initial "toe dip" into the dune in Dingo Gap was planned for Sol 533. In order to learn more about the sand dune in Dingo Gap , the rover will be commanded to drive up to it on Sol 528. MSL drove about 15 meters toward Dingo Gap and returned post-drive images that were used to plan ChemCam RMI and Mastcam images from the new location. Sol 527 Update On Curiosity From USGS Scientist Ken Herkenhoff: Over the Dune? I'm SOWG Chair again today, planning Sol 513, which will be dominated by a full set of MAHLI images of wheels. The weekend activities executed as planned, and the rover is in a good location to start a full campaign of wheel imaging. The CheMin data processing planned for Sol 505 was deleted from the plan, but SAM made another measurement of the atmosphere that night. The MSL tactical operations team is fully re-engaged after the holiday break, planning a bunch of activities to keep the rover busy this weekend. The MSL rover completed the relatively light set of activities planned for the recent holiday, and is now ready to resume full science operations.